Dave Grohl Finds Music's Human Element — In A Machine The Nirvana drummer and Foo Fighters founder says he wouldn't be the musician he is today if not for one piece of equipment in a now-shuttered L.A. studio. Rediscovering it, and connecting with other musicians who shared the honor, is the subject of his new documentary, Sound City: Reel to Real. 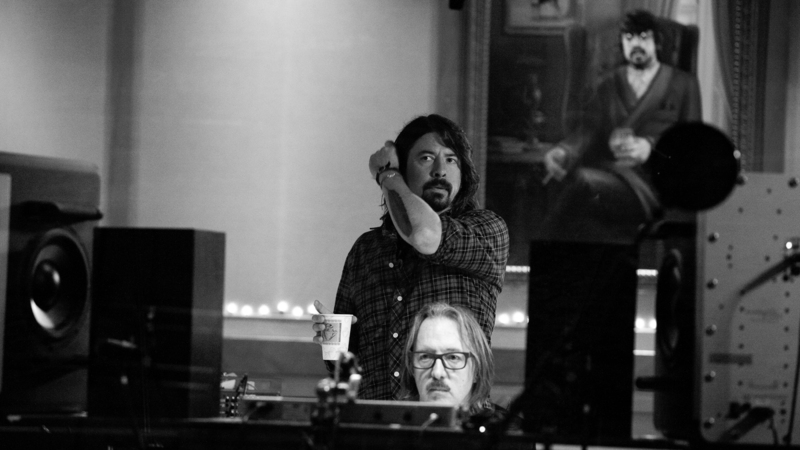 Dave Grohl reunited with his old friend Butch Vig (at console), the producer of Nirvana's Nevermind, for the making of Sound City: Real to Reel. It wasn't much to look at: a nondescript building in the San Fernando Valley with hideous brown shag carpeting on the walls. But from the 1970s on, the Sound City recording studio turned out a ridiculous amount of great music: classic recordings by Fleetwood Mac, Neil Young, Tom Petty, Metallica, Rage Against the Machine and many others. Dave Grohl and his bandmates in Nirvana were practically unknown in 1991 when they pulled up to Sound City in a rusted white van. But the album that came out of that session, Nevermind, turned rock music on its head. In his new documentary and accompanying soundtrack, Sound City: Real to Reel, the Nirvana drummer and Foo Fighters founder pays homage to that studio — and its distinctive soundboard — by speaking to and jamming with other musicians whose lives were changed by recording there. Grohl spoke to All Things Considered host Melissa Block about the making of the film, which serves as a love letter to both a recording environment and the human element of music in the digital age. Hear the radio version at the audio link on this page, and read more of their conversation below. MELISSA BLOCK: Let's talk about that board. It's a Neve 8028 soundboard and that was the studio console at Sound City. What was so great about it? DAVE GROHL: Well, you know, that was a great era for recording equipment. The late '60s and the '70s, a lot of this really beautiful equipment was being made and installed into studios around the world and the Neve boards were considered like the Cadillacs of recording consoles. They're these really big, behemoth-looking recording desks; they kind of look like they're from the Enterprise in Star Trek or something like that. They're like a grayish color, sort of like an old Army tank with lots of knobs, and to any studio geek or gear enthusiast it's like the coolest toy in the world. But they're pretty simple. They're not filled with miles and miles of cable and wires — they're pretty simple. And what you get when you record on a Neve desk is this really big, warm representation of whatever comes into it. What's going to come out the other end is this bigger, better version of you. And so it makes you sound real, but it makes you sound really good. So Sound City had this Neve board, and I think it's the only thing we knew about Sound City when Nirvana went there. We'd never been to the studio; we just picked it because we heard it had this great old Neve desk. So when we came down in that old van and opened the doors to see that the place was a total dump, we were kind of shocked, you know? We had no idea. We'd been rehearsing those songs for months and months in this little barn in Tacoma, Wash. That's where we practiced. And we knew that we had 16 days in the studio to make an album, which, to us, seemed like an eternity. I mean, we were used to recording 16 songs in a day. So this was our big break, in a way. We had signed to a major label — the David Geffen Co. — and we were coming to Los Angeles to make our record. We didn't think that what eventually happened was going to happen but we really took it seriously. So we practiced really hard and came down to Sound City and that short amount of time to make the album. And it really did change my life forever, those 16 days. I don't think I'd be here now if it weren't for that time at Sound City. When I think about how music sounds, I might think about the room it was recorded in or the microphones that were used. I wouldn't think about the soundboard. How does that work? What does it add? Well, you know, it's funny. Most people don't take those things into consideration. When they hear an album, they hear the artist or they hear the lyric or they hear the melody. But they don't really think about the environment in which it was recorded, which is so important. It's that thing that determines what the album sounds like. Every one of these old boards, they all have personality. They all have a different life to them and they all have a different history. It's almost like they have ghosts in them. When we installed the board at my studio, we had to open it up and clean it out. There was like, 40 years of cocaine and fried chicken in that thing. Beyond that, there's the people that worked at Sound City that kept the room alive, that painted the walls when it started looking too dingy or that did the work on the board when it started to break down — the studio managers and the runners and all of these people. They're just as important to Tom Petty's Damn the Torpedoes or Rick Springfield's Working Class Dog as the artists. I mean, when I talk about the human element in the movie, it goes beyond performance and it goes beyond a performer. It goes all the way down to the people that made sure Sound City kept its doors open. There's a great moment in the film when you go to interview the actual creator of the Neve — Rupert Neve himself. And he tries to explain the nuts and bolts of what the board does. And you get this big, goofy grin on your face like you have no idea what he's talking about. I haven't the foggiest notion. I haven't the slightest idea what he was talking about. I think before we even started shooting, I knew that if we had Rupert Neve in the film, we had to ask something so technical that no one would understand, and then subtitle it. And that subtitle reads, as you're listening to him? It says, "Doesn't he know I'm a high school dropout?" Or something like that. It's funny, there aren't too many musicians that also moonlight as studio engineers. There's a few — the really brilliant ones. Trent Reznor is one, from Nine Inch Nails. He's a classically trained pianist and an incredible songwriter and composer, but he's also a great engineer. Someone like me, I set up drums and I beat the hell out of them, and my best friend who works at the studio makes it sound really great. So, when I sit in front of the Neve desk — yeah I could probably put a session together. But when Rupert Neve starts getting that deep, technically, I just, I'm lost. I mean, that's why he's Rupert Neve. He's a genius. For those of us who aren't studio geeks, explain what a console does — how it shapes the music that comes through it. There's a great example in the film, actually. Butch Vig, who produced Nevermind, is an old friend of mine. I've worked with him for years. He did the last Foo Fighters record. He plays in the band Garbage. He's one of our generation's great producers, and he explains what the board does. It's like a big stereo. You take a microphone and you plug it into the console. You sing into the microphone, the sound goes through the cable, into the desk. And in the desk, you can manipulate the sound by making it brighter, giving it more bass, basically like an EQ on your stereo. Then the sound comes out of the desk and into your tape machine or your Pro Tools unit, and then that's the sound that you get. Now, different boards do different things to the sound that's coming through them. An old Neve desk does embellish it in a way that makes it sound sort of bigger or warmer. It doesn't change the performance but it does enhance the way that it sounds. You know, it's the difference between listening to an old record on an old stereo versus listening to something off of your iPod. It really suits rock 'n' roll. I think musicians like me are drawn to those older desks, not just because they're legend and lore but also because they do something really specific that is hard to emulate or re-create digitally. You own this Neve console now; you bought it when Sound City shut down. Why? About three years ago we were making a Foo Fighters record, and I decided that we should do it in my garage rather than do it at our studio. We have a studio called Studio 606 in the San Fernando Valley — it's not far from Sound City, actually. And we've made a few records here. Other bands come to record here as well. It's a big 8,000-square-foot state-of-the-art studio. But for the last Foo Fighters record, Wasting Light, I thought, "Well, we've made two records here. Let's do something different. Let's do something fun. Let's switch up the environment and create an experience. ... And screw computers, man. Let's go back to tape." That's one of the things that we talk about in the film — the debate of analog versus digital. You know, when you're recording to tape, you usually just settle for what you have. There's not a lot of options to manipulate the performance, and we like that. We like to sound the way we sound. So we decided to do it straight to tape in my garage. But I didn't have any gear up at my house, so I started hunting around for a board. Someone said, "We should call Sound City. They're selling off the gear in Studio B." I thought, "Oh my God, Sound City's selling gear? That's crazy!" So I called the studio manager — she'd been there for 20 years and I'd always remained close with everyone there. She was really upset because business was bad. They were kind of on their last legs and they were about to close their doors, so they were selling off some of the gear just to pay the rent. And I said, "I don't really know if I want anything from Studio B, but if you guys ever want to sell the Neve in Studio A ... ." She said, " I'd sell my grandmother before I sold that board." Which is the response I knew that I would get. But I said, "OK, well, just so you know, if you guys ever do want to get rid of it, I would be honored to have it." And maybe about five or six months later, I got the call that they were going to close and they were getting rid of the board. I think they had a conversation about who they should sell it to, and somehow they decided that I should be the person to get it. ... So I didn't even ask how much it cost. I said, "Absolutely!" Because I really did imagine this thing was gonna end up in the Hall of Fame. It was also right around the 20th anniversary of Nevermind. And I thought, "Well, what I'll do is, I'll buy the board and I'll make a short film about being reunited with this recording console 20 years later." I mean, if you consider what that album did to popular music, you have to also consider that this board is part of that. So I thought I would make a short film paying tribute to the board, and it would maybe be a sidebar to all of the other 20th-anniversary attention we were getting for that album. And then the idea just kind of exploded. The short film became a long film. I asked Tom Skeeter, the studio owner, to give me a list of all the albums that were made there. And he kind of looked at me like, "Are you out of your mind? That's 100,000 albums, you know." He gave me a short list, and I took that short list and just started blasting out emails to people. "Hi. My name's Dave. You and I have something in common: Sound City. I'm making a documentary about it and I'd like to ask you a few questions." And of the 40 people that I asked to come sit down and talk to me, 40 of them said yes. And that's when I realized, "Oh my God. This is not a short film. This is a movie." You mentioned when you heard that they were going to sell the console that you didn't ask how much it cost. Do you mind if I ask you how much you paid for it? Well, I mean, you'd be surprised. I would have paid $1 million for this board. I really would have because there's some things in life that you really consider to be priceless. And I know that they paid $78,000 for it in 1973, but unfortunately their return wasn't what you would expect. It didn't cost me $1 million. They gave it to me for a really reasonable price and I think that it was — it had less to do with money and more to do with something emotional or the history of our relationship, my relationship with Sound City. So, yeah, I didn't have to sell any cars or kids to get the board. So as you're sitting in front of that Neve console, does it look like an old friend? Does it look like part of the family? Yeah, it was one of the great things about having everyone come in here to do these interviews. Whether it was Tom Petty or Lindsey Buckingham or [producer] Chris Goss or [Queens of the Stone Age frontman] Josh Homme, everybody had a story about sitting in front of this board. To talk to a legendary drummer like Jim Keltner, who's played with everyone from Clapton to John Lennon to Ry Cooder — it's kind of a spiritual experience. Or to talk to Trent Reznor about technology. Here's someone who is probably considered the godfather of popular electronic music. He's built a career around the juxtaposition of human beings and machines making music together. Had I never even filmed or recorded any of these conversations, I'd be a better musician for just having them with these people. The movie revolves around this board and this studio, the conversation's about something a lot bigger: the human element of music. You can still play with each other and collaborate and capture those magical human moments, but we're living in an age where you can manipulate or change any of that to make it sound any way you want. You can make yourself the greatest singer in the world or the best drummer in the world with the aid of technology. So a place like Sound City, which was just a big, beautiful room where you would hit record and capture the sound of the performer — a place like that isn't necessarily in demand anymore.